The story is absolutely stunning – UC Berkeley casually sold, for $150 plus tax, a massive WPA art work valued at over a million dollars. The art work was created by the Harlem Renaissance artist Sargent Johnson. How did this happen? 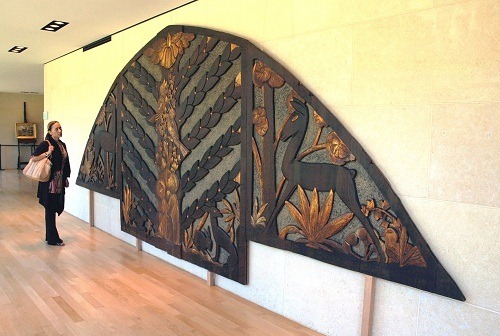 In 1937, under the auspices of the W.P.A., Johnson designed two large Art Deco redwood reliefs, one of which depicted an idealized natural world of gilded gazelles, open-beaked birds, spiky-leafed plants and a boy clapping cymbals. 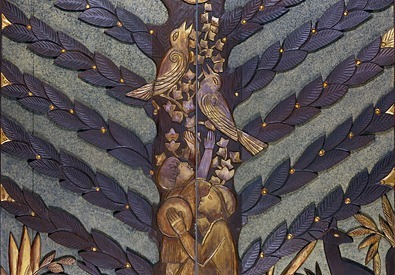 Designed to cover organ pipes at the old California School for the Deaf and Blind in Berkeley, this natural-world relief was affixed to a wall until 1980, when the school moved. As squatters (and rats) took shelter there, the university, which had taken over the premises, moved any valuable property to a secure basement warehouse, and the organ relief was disassembled. But one of the organ screens was misidentified as belonging to Berkeley’s graduate schools, so when the university reopened the building three years later, only one of the two Johnson reliefs was returned to its rightful place. The other remained in storage until 2009, when the university emptied the storage space in preparation for the sale of the building and transferred the relief to the university’s surplus store. That’s where, in late summer of that year, Greg Favors, an art and furniture dealer, came upon eight cracked but still handsome panels in a plywood bin. Mr. Favors did not know what they were or who had created them, but he thought them “amazing and cool,” he said. He paid $164.63, including tax. Movable art from the W.P.A. falls under federal jurisdiction. But according to a November 2010 e-mail from a General Services Administration lawyer to the university … the federal government does not retain ownership of W.P.A art affixed to nonfederal buildings. The university tried to buy back the art work, but it could not raise the funds. It passed to a private New York art dealer who sold it to the Huntington Library. This won’t do the University Art Museum’s capital campaign any good. Someone is in deep doodoo! I wonder if anyone actually is taking responsibility for this fiasco. Mr. Monroe, perhaps the fact that a great number of white folks think that Mr. Johnson’s work is worth over $1 million ought to make you think twice before playing the race card. Robert, that’s a bit unfair. The two people who mention the valuation in the original New York Times article are Michael Rosenfeld, who is described as “an authority on African-American art” and Lowrey Stokes Sims, who is described as “an authority on African-American artists.”) Ms. Sims is African-American, and both are apparently specialists in this subfield. I think that Monroe’s point was that the university officials responsible for the discarding and sale of this piece lacked knowledge of African-American art and artists, which I think is a correct point. I agree that this is a huge embarrassment for the University of California. Theophrastus, I stand by my points. Mr. Monroe is claiming, quite explicitly, that the reason why “the University” isn’t more concerned about losing the artwork is because Sargent Johnson was black (never mind the fact that Johnson was ethnically far more Swedish than African). In his reasoning, black artists are less valuable because of institutionalized racism. Well, rubbish. If you look at Johnson’s direct contemporaries (indeed, his teachers) Beniamino Bufano and Ralph Stackpole, the works by all three are approximately equal at auction. I don’t believe for a minute that a WPA frieze or carving such as this by ANY American artist would sell for more than the low-to-mid six figures, but clearly some like to think otherwise, including some white art dealers. Bufano’s work has been literally given away by local governments as recently as the ’80s. Let me guess: anti-Italian racism. As for this being a “huge embarrassment for UC” — again, I think that’s vastly overstated. It wouldn’t be the first or even the hundredth time that a university practically (or literally) gave away something of cultural and monetary significance; it happens all the time. And most of the time, the university shrugs its collective shoulders, which clearly isn’t the case here. A far bigger embarrassment for UC is the scandalous compensation package they give regents, their tuition hikes, etc. Race may or may not be a factor, but it’s really difficult to comprehend the astounding incompetence on the part of UC. This incident also makes you wonder about checks and balances in the system. After all, this is the same institution that handles deadly nuclear material, and it can’t keep track of a 22 foot long piece of art. That’s half of the story. After discovering their mistake they made little effort to reacquire the piece but managed to cover themselves with a pass from the GSA. Now their spokesperson is crying poorhouse. Well, they just spent $471 million on a football stadium renovation and new athlete training center. If they really cared, they could have made a genuine effort to get the artwork back. Harvey, you make some excellent points, and I agree with you. The university would likely claim that the stadium renovation was funded by private contributions (although, in fact, the university has been subsidizing intercollegiate athletics for year). It is, perhaps, of interest that when UC controlled the contract on Los Alamos laboratory, they were in fact charged with losing deadly nuclear material.